Authentic French Restaurants are few and far between these days but Bistro Jacques delivers in true Gallic style. Situated in the “Old Briggs Shoe-Shop” at the junction of Pride Hill and Mardol, Bistro Jacques is perfect for shoppers, theatre-goers and business types alike and boasts The Darwin Gates on its front step. 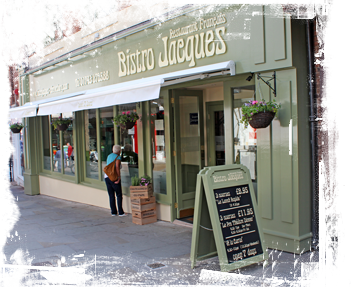 Bistro Jacques offers a warm, inviting, friendly and relaxed service. Decor is of a classic rustic French theme with wooden furniture, candles and walls smattered with prints by French artists. Combined with the toe-tapping tunes from musicians and singers such as Edith Piaf, Bistro Jacques creates a vibrant and bustling atmosphere. There is a good selection of “entrées” and “plats de résistance” and the menu boasts some French favourites, as well as a variety of Mediterranean dishes. The menu changes daily making most of fresh market produce. The bistro opens at 9.30 am for “Le Petit Déjeuner”, and at 11.45pm to 4.30pm every day for the “Le Lunch Rapide” from £8.50. Our “Pre-Théâtre Offre” 3 courses for £12.95 (Sun – Thurs, 4.30 – 7pm, Fri & Sat, 4.30 – 6.30pm). A monthly changing ‘A La Carte menu’ is on offer from 4.30 – 10pm, Monday to Saturday. Our frequently changing menus ensure the very best of fresh and seasonal market produce. Not to mention the hugely popular “Tuesday Wine and Dine” offer, 2 courses from the A La Carte menu plus a bottle of house wine per person for only £17.95 (available all night – same offer available for students on a Monday). Theatre-goers, students, shoppers and the business crowd all congregate at Bistro Jacques, creating an eclectic mix and a wonderful bohemian feel.